I doubt he expected this kind of a response. Fr. Rosica has yet to see the whites of our eyes! Stay strong in the Holy Spirit of God my friend, and re-read Ephesians 6 often! You are a front-line warrior now, and you have MANY prayers being offered for you. God bless you! PS Father Z piled on today. Fr. Z has desperately tried to stay out of the unseemly fray of the past 2 years, as he knows he could be squashed like a bug. His report is objective, basically just re-posting material without comments except to clarify facts. If he wants to run with the big dogs, he cannot ignore things like this, and it's meaningful he's at least making sure the info gets out fairly. Good on ya my Friend!! God Bless! The threat to sue is meant to scare another. The threat serves a purpose but two things it does NOT serve: charity and truth. God bless you efforts, Vox Cantoris. And, thank God for the First Amendment. Praying for you, and praying for Fr. Rosica to stop his madness. And, I'm posting links to the responses at my blog. Rosica is a Modernist crypt-keeper. One of his heroes is Gregory Baum....enough said. 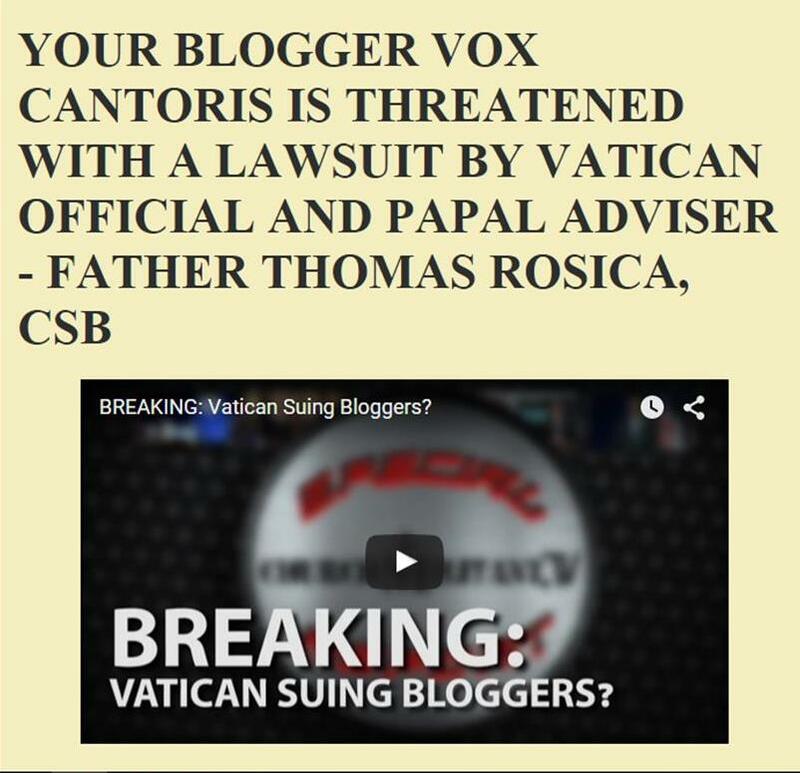 The faithful holy fire of Vox Cantoris, must be exceedingly painful to Rosica. Good!!! I do hope that these many blog owners can further show their support for Vox by turning their blog eyes onto Rosica. Please, with Vox, pick up the torch. Don't let Rosica breath. Examine his every word through the lenses of faithful Catholicism. Don't see Rorate in your lineup. "Every one commits extortion who, without reasonable justification or excuse and with intent to obtain anything, by threats, accusations, menaces or violence induces or attempts to induce any person, whether or not he is the person threatened, accused or menaced or to whom violence is shown, to do anything or cause anything to be done." "Extortion criminalizes intimidation and interference with freedom of choice. It punishes those who, through threats, accusations, menaces, or violence induce or attempt to induce their victims into doing anything or causing anything to be done. Threats, accusations, menaces and violence clearly intimidate. When threats are coupled with demands, there is an inducement to accede to the demands. This interferes with the victim's freedom of choice, as the victim may be coerced into doing something he or she would otherwise have chosen not to do." Insofar as what you have said is true then you have an absolute defence. Beyond that you have the defence of fair comment on a matter of public interest. At least that is my view from the U.K. I think this is just a frightener letter and I doubt if they would pursue what looks like a pretty flimsy case to me. I wonder if Fr. Rosica has ever heard of the Streisand Effect. Rosica's views are consistent with the message of the current pope, and he knows it. For this reason alone he may consider himself untouchable. It is possible that he truly believes in what he is saying. To the compromised and unfaithful God sends a strong delusion. Maybe Rosica's threats are not anything other than righteous indignation, an attempt to quiet (for the good of the rainbow church) fundamentalists and extremists, who are on the wrong side of history, an embarrassment, a threat to global peace and COEXIST "harmony"? Maybe he really doesn't know the Word of God, only politics and modernist ideology? Thanks for listing my posts above. I'm most honoured to be among your supporters. If it comes to money, there are people -- we may not individually have much -- who will donate to help you. You will just need to ask.